The first time I tried on “yoga sandals”, I had two thoughts, why would anyone want to wear these and holy moly they hurt my feet. What I now know is that they are truly “yoga” for the feet and stretching my feet to a healthy position every time I wear them. They are great for all of us and especially women that wear heels or confined shoes all day. They have helped my students that struggle with plantar fasciitis. For me personally, they helped strengthen my feet after I broke my baby toe. I wear them as my “house shoes” and started by wearing them about 20-30 minutes per day and can now wear them all day. 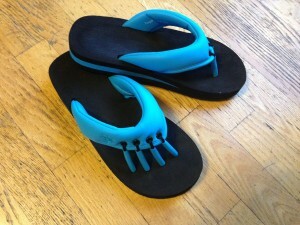 My favorite is that they now sell them in bright blue and thinking I need another pair in the bright pink! !